Pinecam.com • View topic - A TASTE OF THE FOOTHILLS IS TODAY!!! Come join us! Post subject: A TASTE OF THE FOOTHILLS IS TODAY!!! Come join us! A TASTE OF THE FOOTHILLS IS TODAY!! from 10-4 at Evergreen Memorial Park! Come and join this event to support Peaceworks Inc. and the Mountain Peace Shelter! Enjoy great food from many local eateries, fabulous wine and beer vendors, a silent auction with over 200+ items, a photo booth to capture the memories, many fun fall children's activities, and lots of GREAT FAMILY FUN! Advanced tickets are now on sale! $10 for adults and $5 for children. Advanced ticket sales are available online at http://www.peaceworks4u.org. Tickets can also be purchased on the day of event and are $12 for adults and $7 for children. A terrific deal for a lot of family fun! ALL proceeds from the Taste of the Foothills Fall Family Festival support Peaceworks Inc. and the Mountain Peace Shelter, the only domestic violence shelter and 24/7 confidential crisis hotline in Park County and mountain Jeffco. Last edited by MPBoutique on Oct 18, 2014 9:36 am, edited 3 times in total. Post subject: Re: A TASTE OF THE FOOTHILLS IS OCTOBER 18th!! Post subject: A Taste of the Foothills Benefit THIS Saturday 10-4!! 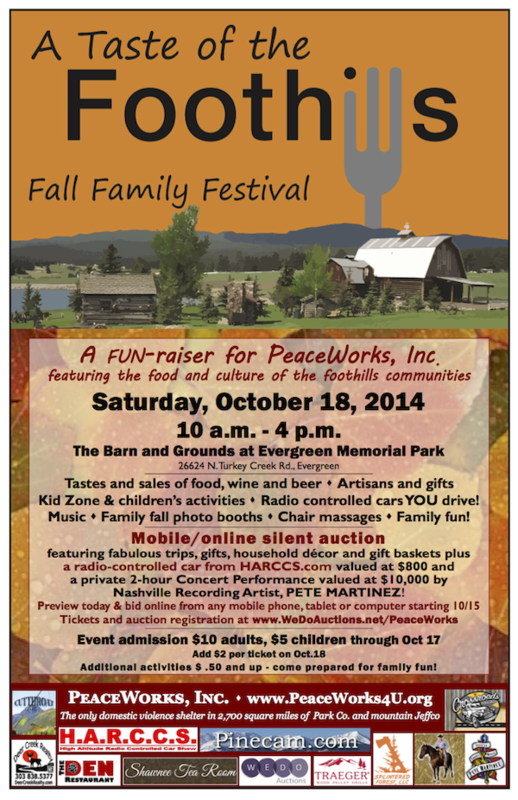 Post subject: A Taste of the Foothills Fall Family Festival 10/18!